Hooray! Finally the first day had come! Officially rain was predicted for today and had been all week but once our intentions became clear the sky gods sorted themselves out and we awoke to a perfectly clear and cloud free morning! Our very first destination for our trip was Nokogiriyama! Nokogiriyama (鋸山 = Saw + Mountain ) is small mountain located across Tokyo Bay towards the south of the neighbouring Chiba (千葉 = Thousand + Leaves) Prefecture. The name Nokogiriyama is appellative and was coined after the distinctive saw tooth shaped cliffs which abut the nearby ocean. This feature was formed not from natural processes, but from countless hours of manual labour by quarrymen who used the rock in centuries past to stabilise the marshy capital of Edo (now Tokyo). If that wasn't enough, the other side of the mountain is home to Nihonji temple. This temple was founded 1200 years ago and is home to a giant stone Buddha whose scale exceeds even the mighty daibutsu (大仏 = Large + Buddha) of Nara's Todaiji. It's also famous for containing 1500 stone Ararat statues. We had considered Nokogiriyama as a destination from Tokyo previously, but had always passed it up in favour of closer or more famous sites. This time though, we made it a priority- especially after getting a strong recommendation from someone who'd given us great advice in the past. After Nokogiriyama we planned to spend the rest of the afternoon exploring the prefecture capital, Chiba City. The traditional way to visit the area is to catch a train down past Yokohama to the port of Kurihama and then cruise across the Uraga Channel on the Tokyo Wan Ferry (wan = 湾 = bay) to Kanaya from which it's a short walk to Nokogiriyama. We decided not to go this way though as it would take nearly two hours to get to the port (with two transfers and a thirty minute walk) and then a further forty minutes and 700 yen to reach Kanaya Port. On the other hand we could get a direct limited express train from Shinjuku which would arrive at the even more conveniently located Hamakanaya station after just one hour and forty minutes. It would also not cost us anything extra as we'd be able to use our JR pass the whole way. We did have to be a little careful though as this method had a small catch- the only train we could make it work with left at 07:50am. There was one another later train at 9:08am though that one wouldn't leave us with any time to explore Chiba. This was not a problem though as despite our late night we were both still running on Australian time and woke up before 6:00am (I only got about four hours sleep- so excited!). This meant we had plenty of time to enjoy our included breakfast. The breakfast offerings at the City Hotel Lone Star were a little Spartan with just four types of bread to choose from and three toasters. The bread provided was pretty high quality and we could choose between croissants and three types of rolls (soft, corn and grain). There was also some spreads (jam, butter etc.) available to put on the bread or toast. After stuffing ourselves with carbohydrates we made our way down to Shinjuku station. As it was early Sunday morning the area had a post-party kind of feel to it and careful observation of the ground revealed patches where people had leaked various bodily fluids the night before (mostly vomit- hopefully). That's a little hyperbolic, it's Japan, it was pretty clean and much of the rubbish had even already been sorted into piles and shop keepers were scrubbing their footpaths. Anyway, time travelled fast and before long we were disembarking at the small station of Hamakanaya. Although Mount Nokogiri is perhaps barely a mountain, with a height of only 329m, it is serviced by perhaps Japan's shallowest ropeway? I guess not, since many are horizontal with barely any elevation change at all. It certainly did have a short ride time though taking only three minutes to reach the top. I'm getting ahead of myself. Our plan was to catch the ropeway up to the top of Nokogiriyama, have a look at the view from the ropeway station and surrounds and then walk through the Nihonji temple back down the south side of the mountain. Once at the bottom we'd keep heading south to the nearby Hota Station and from there catch a train to Chiba City. Our first task then, was to find the ropeway! Experience (lit. contact) Kanto path. "Ferry Terminal Information" From the train station the ferry is an eight minute walk. (turn left at intersection). It's the blue box on the map. On the way is a post office. Hamakanaya (浜金谷 = seaside + gold + valley) is a pretty small station and the area is best described as a sort of rural seaside town. A few other people got off the train with us and soon disappeared. There were a couple of maps around the place and a brief look at these indicated that all we had to do was head towards the ocean and turn left! Along the way we encountered a few elderly Japanese people who were also headed to the ropeway and who let us pass along the narrow road shoulder with a smile (and a "wakai desu ne" 若いですね - commenting on our youthfulness!). The road we were walking along followed the coast and we noticed that there were a lot of tsunami warning signs stuck up about the place (e.g. on power poles). They basically just said to watch out for tsunami and gave a height above sea level. At one point along the road we also saw a boat. Soon we came to a sign telling us to turn left for the ropeway. After short climb we arrived! There was a huge line! I guess because it was nice clear Sunday morning. It looked like they were all together and part of one of those ubiquitous domestic Japanese tours. They already all had tickets and were waiting in line to get onto the next gondola, so we were able to buy our tickets from the window (¥500 one way) without having to wait. It was a good thing we bought them when we did too as another big tour bus had just pulled up outside. At about this time the gondola started filling up and we joined the queue at the end. Unfortunately we didn't get on and were about ten back from the start. Due to the new tour bus there were about fifty or so people behind us. There was a sign with a timetable for the ropeway up but it was thankfully not being followed (it had large intervals) and after only a few minutes it was our turn to ascend the mountain! The ropeway was pretty typical and as we rose we were awarded with an amazing view over Tokyo Bay. As we disembarked we saw signs forbidding photos in order to prevent people clogging up the gondola exit. The rest of the ropeway building was well set up for viewing and we climbed up to a large observation deck on top to take in the panorama. The coastline with many capes, inlets and islands stretched off to the south while to the north we could see across to the megalopolis on the other side of the bay. The ocean was a sparkling blue that complimented the paler blue of the sky above. Within the bay we could see the economy chugging along in the form of several large cargo ships. Particularly notable was a massive LNG tanker being pulled along by a small tug boat. We were also very surprised to notice Mt. Fuji towering up out of the clouds opposite. It looked absolutely ginormous and we'd originally mistaken it as part of the background clouds. At first I didn't think it could possibly be the mountain. Closer, we looked down upon the mountainside and coastal townships. We really liked the colours of the different trees- they were shades of green we hadn't really seen before, some looked nearly florescent. Amongst the trees below and bursting out of a nearby mountain was an expressway. Much closer, perhaps too close, there was a near swarm of massive insects buzzing around our faces. I thought at first that they might be some of Japan's infamous giant hornet though upon closer inspection we decided they were some sort of giant bee. It was just as well they were not at all aggressive, though Kate was a bit freaked out by them. Personally I'm just glad they were not flies. I hate flies. Anyway, apart from the roof of the ropeway building, it was also possible to walk a bit further around the top of the mountain and over to the edge of some of the cliffs. It was around here that we found a plaque marking the summit of Nokogiriyama. The cliffs we could see were quite impressive as well and I remember we got a particularly good view of their jagged nature on the way up the ropeway. Unfortunately I couldn't get a decent photo from within the crowd. Once we'd sufficiently taken in the views we walked down some steep stairs towards an entrance to Nihonji temple. The path down was a little steep and rough- but nothing too intense. At the entrance gate we paid 600 yen each for a ticket and at the same time received an English brochure and map. Although when you first look at the map (See end of blog post) the place may look like a crazy maze there is actually a pretty standard sort of route you can trace to see everything with minimal back tracking. Following that route, our first direction was left up some steep stairs to the Jushhu Ichiran Dai ( 十州一覧台 = ten + province + one + perusal + pedestal) or, the ten province observatory. I don't know the details but judging from the name I assume that ten provinces were able to be seen from here in the past. Now I'm not so sure about that specific spot, but considering the whole area I'd say we could see five prefectures- which is pretty good! I'll briefly explain the ones I counted: Chiba is obvious, Kanagawa and Tokyo are both visible across the bay, and as Mt Fuji is right on the border between Yamanashi and Shizuoka and clearly visible, they get counted as well. Also at the observatory was some sort of statue which some temple ladies were cleaning (so no photo). What's that up in the tree! Nope, it's a man violating probably a dozen OH&S laws in order to trim some trees. Keeping with the theme of the mountain he was juggling a pretty serious looking saw. After walking back down the stairs we followed a path then a narrow gorge to the Hyakushaku Kannon (百尺観音 + hundred + measure + outlook + sound). Kannon is the Buddhist goddess of mercy, Hyaku means a hundred and a Shaku is an old measurement equal to about 30cm. 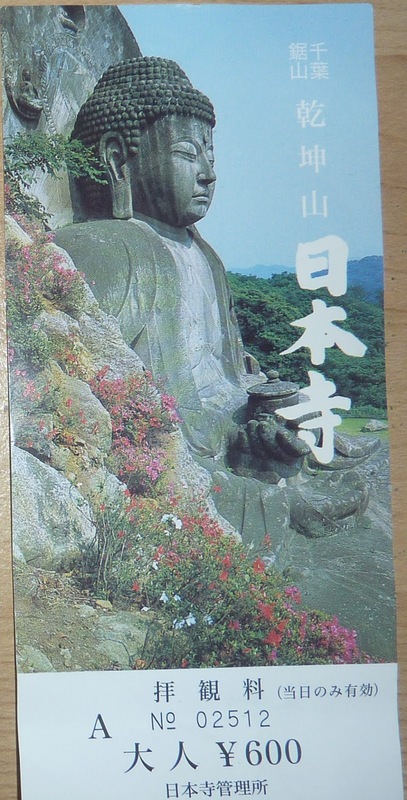 It's exactly what it says on the tin; a giant 30m statue of Kannon. The carving was vertical, within a deep rock alcove and was really quite impressive. A number of people were taking turns to pose in front of it and a worker at the temple who was sweeping leaves offered to take our photo. When he showed us his first attempt it was amazingly bad! He had swirled the background somehow. It was the camera's fault not his though and take two was much better. From this area we could see up to the Rurikou Observatory (瑠璃光展望台 = Lapis lazuli ray observatory) or more colloquially, Jigoku Nozomu (地獄のぞき = earth + jail + Nozoki) which means "peering into hell". It looked very precipitous and reminded me of those Wile E. Coyote type cartoons where a triangle chunk of cliff would always fall off. This was our next destination. They were getting quite tiring. Apart from the distant scenery we were also able to closely examine the vertical cliff faces. It's amazing to imagine how much time it would've taken to carve out all this rock by hand. Climbing up to this view point was our last ascent and the rest of our time on the mountain was spent following the path as it weaved down, along and in some cases inside the mountain. It was along this path that we saw the many stone figures of Tokai Arhats that were carved around 200 years ago by artisan Jingorou Eirei Oono and a number his apprentices. In Buddhism a Arhat is someone who has obtained Nirvana and all those represented here were carved to each have their own unique expression. Unfortunately, a great number were missing their heads due to an anti-Buddhism movement around 100 years ago in the Meiji Era. Thanks to recent restoration efforts though there were plenty of reattached heads we could enjoy. As I alluded to before, the path was quite scenic itself containing, apart from the statues, many tunnels, caves, cliffs and even some waterfalls. A few of these emptied over the path and made it look like it was raining. Not all of the restoration efforts had succeeded. After seeing many many statues and climbing down a fair number of stairs, the path levelled out and we began the approach to the Daibutsu. Including pedestals this statue is over twice the height of the Daibutsu in Nara's Todaiji and over three times as high as the Great Buddha of Kamakura. It was carved over a period of three years by the same people who had carved the Arhats statues. Unlike those statues though the giant Buddha had definitely retained his head. I can imagine the situation. A group of people discover this Buddist temple and decide to desecrate it. They got more than they barged for though after continually discovering evermore statues to destroy. Finally when they think they've got all of them they discover this huge fellow and think "Oh bugger that!". His body is 21.3m long and the total height is 31.05m. I have no idea how heavy it is though a very quick and rough calculation gives about 29 000 tonnes. So- heavy. At the daibutsu the were a few benches and we bought some Aquarius Zero drink from a vending machine and ate some nuts Kate had brought from Australia. There was also a moat around the Daibutsu and inside we found a cute little green frog! Not long past the tree we reached the end of the temple and continued along a road down towards the bay. It was around 12:25pm and we were both feeling quite hungry. We hadn't actually looked at the train timetable to get back and were not really sure how far away the station was so I pulled out my phone and turned on the pocket WiFi. I looked up the next train first and discovered that there was one leaving in five minutes with the following one not leaving until an hour after that. Thinking that we might make it (though no time to check a proper map- looked ok according to the temple one), we started to sprint down the mountain. There were a few signs pointing out the direction to the station and as we ran a few residents doing farm type things stared at us. After a couple of minutes we reached a sign that had the distance remaining written on it (1.3km) and gave up. There was no way we could run over a kilometre in two minutes (we'd need to go 40km/h- about Usain Bolt's max speed). It took us about 20minutes or so to walk the remaining distance. While we were following the track a Limited Express train whizzed past in the other direction- it was pretty fast and exciting! 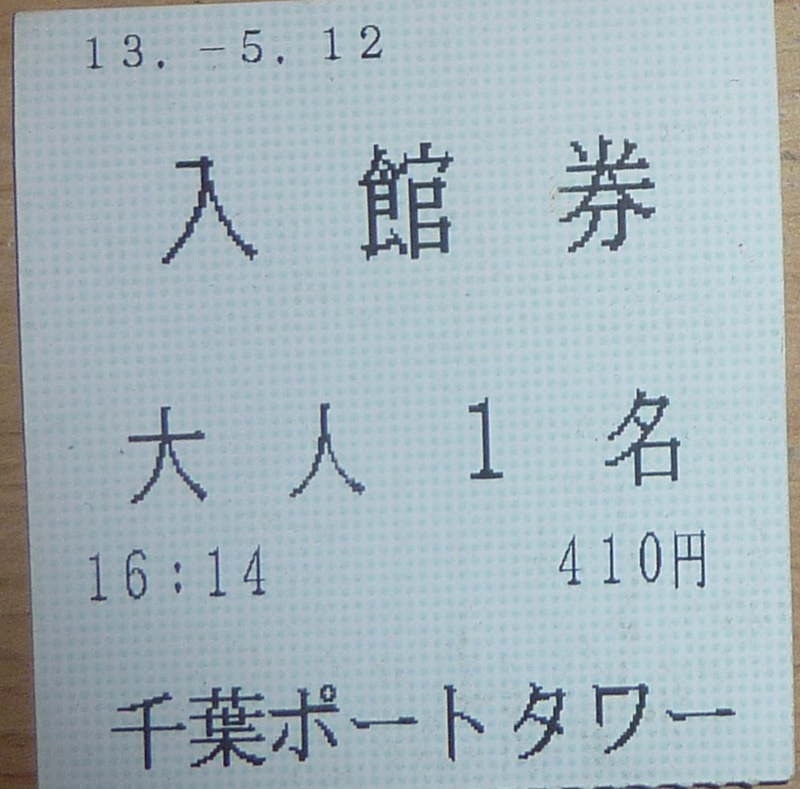 The next train to Chiba (13:22) was a normal train which would take about an hour and a half. The following train (13:32) was the one we were aiming for as it was a limited express and would only take an hour, meaning that we'd get there earlier. Since we were pretty hungry and had about forty minutes to burn and we had a little look around the town of Hota. Unfortunately though we didn't find anything that was cheap, quick, appetising and didn't look too scary to venture into. We also figured they'd be plenty of options in Chiba. To keep us going Kate got some dried flavoured noodles from a really dodgy looking vending machine (the sample packets were stapled to the back of the display). She actually wanted some tomato pretz though that button didn't work for some reason... The price was definitely right at least. My phone GPS still hadn't worked out where the hell we were since we landed so I used our time to let it sit and search for the 20 minutes it required (goodbye 15% of my battery life). It needed to re-download an almanac (from the satellites). It would've been quicker if it didn't keep stopping the download all the other times I had tried to use it and gave up. Stupid thing. Anyway, we spent most of the time waiting near bicycle parking at the station and walked over to the station and platform when it was finally time. Somehow we'd forgotten to reserve a seat again and so sat unreserved. The train was pretty comfortable. Once we arrived at Chiba we immediately went to seek out some food. We found some Gyouza and Sushi for Kate and some fried chicken thing and rice for me at the basement level of a department store. We split up a little to buy our respective foods and when we reconvened Kate informed me that she'd got in trouble for sitting down at another shop's tables to open her sushi (she thought they were all associated with each other). Finding somewhere to sit is a perpetual issue in Japanese cities. It's rude to eat and walk- but there's nowhere provided to eat anything! Anyway, we managed to find somewhere near some bus stops and quickly finished our meals. Chiba City is the capital city of Chiba Prefecture and with a population of around one million people it one of the top fifteen most populous city in Japan. However, due to its proximity to Tokyo (about 40km) it is often considered to be just a suburb or a commuter city of the megalopolis. I was quite interested in one of Chiba's most famous attractions, the Chiba Urban Monorail. It's famous for being the longest suspended monorail in the world. Yep! The tracks are on the roof and the cars hang down below. How cool is that? To make things even better, while we were there one of the cars had been completely moe-fied with anime "ore no imouto ga konnani kawaii wake ga nai" (俺の妹がこんなに可愛いわけがない- long title even in Japanese). This was done as part of the 2013 Anime Contents Expo to promote the show's second season. The reason the monorail was chosen is because the anime is set in Chiba and the monorail is featured in the opening song of the first season. I think it's quite a significant endeavourer as Oreimo is a definite Shinya (深夜 = Deep + Night) anime; it's a lot of exposure/approval even for Japan. It wasn't like the whole monorail was transformed though and due to the length of the lines it would be quite easy to miss seeing the train if you didn't plan ahead. The Chiba Urban Monorail website helpfully provides a timetable for each day detailing when the car will arrive at each station and I had included a copy for today in The Japan Book. The next one wasn't coming for a little while so after lunch we decided to have a bit of a walk around the area. After wandering around for a while it was time to return and we stupidly decided to follow the monorail tracks above us to get back. Seems like a reasonable idea, but they curved around quite a bit and it took more time then we were expecting. Eventually we reached a station and thought we could wait there instead of Chiba. The monorail had two different lines and we happened to be on the wrong one. So now we're absolutely sprinting back down to Chiba station. We thought we wouldn't be able to make it as we still had to buy tickets when we arrived though we realised we could use our Suica cards. Lots of people had cameras out and were taking photos of the Itadensha (痛電車= Pain + Electric + Car). This actually made it quite embarrassing for me to take photos. I didn't want to be one of the dorks with their cameras out! As you can see I managed a few though. Apart from the people obviously here for the car there were also quite a few normal commuters as well. I wondered what they thought about all the fuss. Our next destination was the Chiba Port Tower located a short walk from the terminal Chishirodai (千城台 = Thousand + Castle + Podium) Station. It's located about two kilometres from Chiba station so after just a couple of minutes it was time to get off. I quickly dashed to ground level to get a final glimpse of the train as it returned back up the line. Regrettably, I think I might have originally lead us off in a non-optimal direction to get to the port tower as it ended up taking us quite a while to get there from the station! I was quite pleasantly surprised by the tower. For some reason most of the online reviews had been pretty derisive so I wasn't really expecting all that much. The Chiba port tower was really skinny, shaped like a lozenge (the shape, not cough lolly) and sky coloured! The building was also highly reflective such that even the sky in the building contained clouds. I'm actually quite surprised it was allowed. We could go right up to the tower which was surrounded by grass on one side and some concrete stairs on the other. We were not sure how to get in at first but soon found that you could walk around and down to another level that went under the grass/steps. Inside we found a large tourist oriented area and went over to buy some tickets to go up the tower from a vending machine. It cost us 410 yen each and we took it over to the people manning the entrance to the elevators. Initially only we were waiting but after a couple of moments a few other people joined us. The ride up the elevator was quite exciting as we could see straight through the otherwise empty tower. After our ride the elevator deposited us at highest of the three floors at the top. We both quite enjoyed the view from the top which was 113m high and looked out over the Chiba Port area. One of the complaints about the tower online was that it looks out over ugly industrial development however I found it quite interesting to look at. There were lots of cranes, ships, silo's, chimneys and large piles of ore awaiting refinement. Closer to the tower we could see the large Chiba Port Park. Within the park there was a very large crab! After we had taken in the view we went down to the next floor which was a restaurant/food level and I bought some Hokkaido flavoured cheese ice cream. I was hoping it would be like the stuff I loved from the Seicomart convenience store in Hokkaido last year. As you might expect, it was nothing like that and a little icy but still quite nice even so. The elevator back down left from the bottom top floor which was one of those weird sort of romance/lovers things that are quite common in Japan at these sorts of attractions. You can buy love heart shaped locks to attach to a fence, take a photo in front of a love heart and there was even a love themed shrine where you could buy "love knots" (paper that you tie to something). Once we reached the bottom we had a little look around the Omiyage (お土産 = Ground + Production = Souvenir) store and Kate bought some peanut wafer biscuit things. Peanuts are one of Chiba's local specialities (名物 = noted + object = meibutsu). I had looked up train times a little earlier using Hyperdia and noted that there were a number of different connections we could make to get back to our hotel though I didn't take much notice of the actual times. We decided to walk to Chiba station rather than get the monorail- mainly because we didn't want to pay for it. There was another nearby JR station to the Port Tower though it wasn't particularly convenient for getting to Shinjuku. As if it was deja vu though I checked the times when we were half way there, realised that there was not always an excellent connection and we were sprinting for the third time today. We ran for over a kilometre but in the end missed the train by a huge margin (about three minutes). We were really exhausted from our sprint; it was hard navigating and running with all our might. Especially with roads, buildings and dead ends. It turned out not be a huge deal and train we did end up getting was quite a nice one (a limited express I think), and didn't get us in all that much later. Once we reached inner Tokyo we changed to another train and realised that if we stayed on it past Shinjuku we'd end up in Nakano. I really wanted to do some anime/manga shopping at Nakano Broadway. I was already planning to check out Osu in Nagoya as well but Tokyo is Tokyo and can't be beat. It was enough of a tragedy that I wouldn't have time to visit Akihabara so I definitely wanted to visit Nakano. As with last time I wanted to stock up on manga. Since Kate can't really read anything in Japanese it's a bit boring for her, so we decided to split up. This was the first time we'd separated while both outside overseas before and so we made sure to agree on a good meeting spot (Nakano Broadway entrance) and a time since neither of us had any way of contacting each other. If neither of us showed up after twenty minutes or so the plan was to head back to the hotel. I gave the pocket WiFi to Kate since my phone was flat at this point and took her watch. I only spent about half an hour shopping and like last year bought a massive stack of books from Mandarake. They were second hand, at a great price but still in excellent condition. I think I spend about 6000 yen and got around 14 books. Most of them were large format ones (Yuru Yuri, Lucky Star, Hidamari Sketch), which are a bit more expensive than the smaller standard manga size. I still had about half an hour to wait though so spent some time browsing the other stores before meeting Kate at our meeting spot. She said he had spent the time looking in UNIQLO and had even bought a skirt she liked! After that she then spent most of the time relaxing in a nearby coffee shop. I hadn't eaten since lunch so we stopped at a vending machine waiter restaurant in Nakano and I got some Tempura Soba which was nice and filling. We then caught a train back to Shinjuku, walked back to our hotel and called it a day! Tomorrow we're off to the Kawaguchiko of the Fuji-5 Lakes region! The next post should be out at 19:07 AEST Monday, 15 July 2013. Hello, may I know how long you took to climb down the mountain? To be honest I can't remember but I think it would take around 20minutes to go straight down. There's lots of paths though so if you wanted to explore them all it would take over an hour.